One of the features that attracted me to Chess-wise Pro was the FICS client. As persistent socket connections were once disallowed on iOS applications, Apple’s withdrawal of that limitation has meant that playing online chess against decent strength opponents is now possible; and enjoyable. The ability to play chess online from the comfort of a sofa means casual blitz is possible. Tablets moves the serious chess player away from a mouse-dominated game towards something a lot more natural; back to the good old days. In terms of online play, Chess-wise Pro doesn’t disappoint. Right off the homepage of the application there’s a button simply titled “FICS”. This logs you into the Free Internet Chess Server with a guest login, and you are then presented by a visual list of game offers. Tap one to select, and Murphy willing, you’re playing a game. The board is very decent. I’d prefer the last move notation to be clearer, perhaps not camouflaged in the app title bar. Since on a tablet there’s space around the board in both landscape and portrait modes I’d have preferred to see the last two or three moves listed. I haven’t really played on FICS for about a dozen years, I use it just to watch relayed games of Super Grandmaster tournaments and matches. But I did play a few games for the purposes of this review. I liked this form of online play. I actually played on FICS while on my commute into work on the train, over 3G. I am impressed that the connection didn’t drop, and I played several games. I very nice feature is that Chess-wise Pro stores all your FICS played games into a PGN file for later review. A stonkingly useful idea. (Pity the games against the computer aren’t saved to their own database too!). Chess-Wise pro also impresses with it’s chess database functionality. Initially this points to three online databased covering covering Tournaments, Matches and World Championships. Plus a database for your FICS games that’s populated automatically. The Database button takes you to a navigatable list of PGN files. Selecing a database gives you a three column quick display mode, which allows you to skim through the selected database, play through the game. Export it to email or the clipboard (I have no idea how this is then accessible to other applications, I didn’t even know the iPad had a clipboard). The database is definitely useful, but a little clunky. Searching for games between two grandmasters returns a list of results, but it’s missing the year the game was played, and it’s not clear what the order of games is. It’s these little details that hinder this being a must-have chess app. The start screen is confusing. It’s hard to tell what the difference is between a button showing one person, and an icon showing one person and a clock. Both take you to a board to play against the computer, one allows you to set the chess engines’ average thinking time per move, the other sets a time limit for both players. Personally, they are both facets of a timed game. The FICS button only makes sense for people who know what FICS is. The start page has a button usefully titled Help, which contains a brief overview of the application. But inside the Help itself there is no obvious mechanism for exiting back to the start page. I had to force quit the application and restart to get back to the start page. Thankfully it’s very hard to screw up the understandability of a chess board. Unfortunately the same can’t be said of the icons around it. When you are playing a game, the house icon (recognisable as a home button) triggers a “New Game” dialogue. To get back to the start screen of the application you need to tap the icon that’s either supposed to be a target or a 2D tornado funnel. Forcing the chess engine to move is done by tapping the rotate 180 degree icon. In other chess programs this icon is immediately recognisable as the rotate board option. Chess-wise uses an downward-pointing arrow for rotating a board, an icon I initially interpreted as a “force engine to move” button. 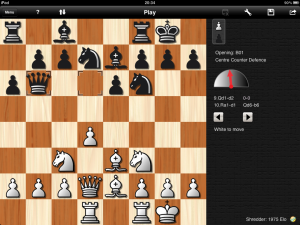 In play, a couple of times the chess engine has hung and refused to move. Most notably when it’s running out of non-losing moves. It’s almost like it’s petulant and skulked off. The activity indicator keeps animating, which suggests there’s some processing going on, but nothing happens, but the UI is still responsive. 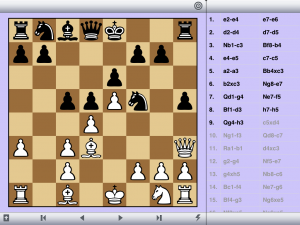 In the analysis mode I’ve had a few weird crashes right after the analysis engine carries out moves like invisible white knight takes white queen on c3. I wanted to like this particular chess app. The FICS client is the strongest feature here, and probably the prime reason for purchasing. 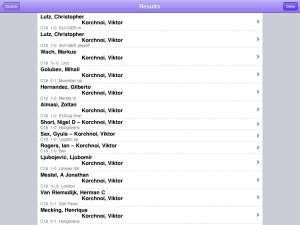 The additional features are not at an acceptable quality level yet, which means there is a lot of potential for this application to be the one essential app for serious chess players. The UI needs improvement. Aart Bik’s Chess for Android is a free app that plays chess, unfortunately the overall quality falls well short of Chess Genius. The chess engine, BikJump, isn’t a strong engine. It’s C++ version is currently rated at 2086 on the UCI-based rating system, and that’s on desktop quality hardware (so 800 points behind the leading engines). The Android version is a Java derivation for a less capable platform, so obviously that top-line playing strength takes a hit. But it’s also up against ferociously strong engines that are either remarkably portable, or have a recognised history of support on ARM-like processor architecture (like Chess Genius). So the playing style and strength is disappointing. When you need to be at 30 seconds a move just to have a decent playing strength and it’s still weaker than Chess Genius at it’s immediate 1 second a move you know the engine needs a lot of work to be competitive. I was disappointed with it’s openings book. Being out of book 7 moves into a main-line Modern Benoni is just asking for trouble. The middle-game play is equally horrible, too many times there’s a good chance for the engine to take the upper hand, and it ends up giving away a pawn for nothing. It’s like the horizon effect is too close, like there’s a limit on search depth. Or perhaps the current algorithm isn’t pruning out enough bad moves to spend time looking at the good ones. The endgame is tolerable, so it’s useful for getting the hang of rook endgames. But it’s not going to play that perfectly through calculation. The board interface itself is pedestrian in comparison to Chess Genius. There’s no drag interface, so you have to tap the start square and tap the end square. On the plus side, I don’t recall many mis-placing of pieces. Perhaps the tap interface is better currently, though I missed not having the option of dragging pieces. There’s also no decent visual indicator of a move, if you miss the animation, you have to check the move list to see if it has made a move. The menu system is a little bizarre, especially when trying to play Black. You start a new game, then click switch sides to get the engine to make a move for White, and you still need to go into the Options menu to rotate the board 180 degrees. This is indeed fixable. The option for rotating the pieces is bizarre; quite why anyone would want the board rotating 180 degrees on every move isn’t something I understand. I’m focusing on the board and the playing strength because there are no other features. There are no tactical puzzles, or training modes. There’s a very simple PGN load and save, so it’s possible to play through saved games, but that falls short of the Chess Genius interface of navigating through a PGN file of hundreds of games. 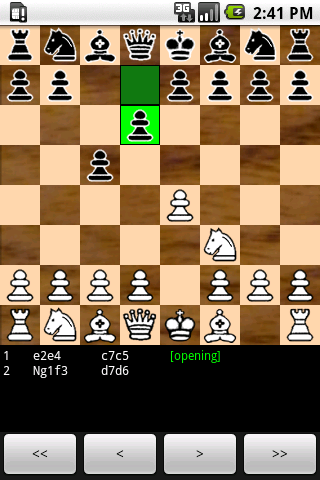 The one single redeeming feature of Chess for Android is the UCI support. Which means being able to plug in different chess engines – particularly stronger ones. The current list of Android UCI engines shows a couple of strong engines, like Stockfish, Toga and GNU Chess. Looking at the cross-table it’s plain to see that BikJump lags very far behind every other chess engine so far tested. 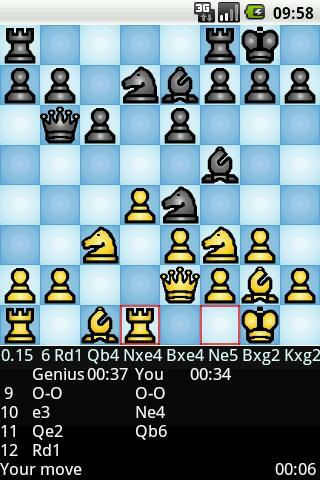 I’d keep this free Chess app installed on my Nexus S only to have a UCI-supporting chess board. If I find a better chess app that also supports UCI, then I’ll have no reason to keep this chess app installed on my phone. It won’t be the first app I’d try on an Android tablet either. It’s a free app, so I am getting what I’m paying for. But I know Stockfish is available as a free Android App, so the quality bar even for free is far above what Aart Bik’s Chess for Android currently reaches. engine at a very low price. 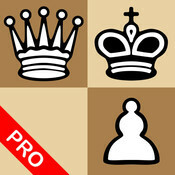 Chess Genius landed on the Android App store earlier this year. Developed by Richard Lang who has an extraordinary track record for chess engine development across multiple platforms over the past 30 years. Lang’s expertise in building strong chess engines running on very constrained hardware is possibly ideal for mobile devices and platforms. Lang is no stranger to mobile devices, Chess Genius actually ran fairly decently on the Palm Pilot and impressed on the Dell IPAQ / Pocket PC. Chess Genius has a pedigree second to none. It first announced it’s international arrival by beating reigning World Champion Garry Kasparov in a rapid chess match back in 1994 (It was the first round of Intel Rapid Chess Grand Prix event held in London). Back then it was running on a Pentium Processor. After a couple of years of fame Chess Genius gave way to the likes of Fritz and Junior. Chess Genius has a remarkable pedigree; it’s programmer is Richard Lang who has been involved in chess-engine development since the ZX Spectrum days, starting with the 1981 European Chess Champion Cyrus IS Chess, and the much respected Psion Chess for the Sinclair QL. Processor wise, Lang developed chess engines for a range of processors: Zilog Z80, Motorola 68000 and the Intel 8060. Using the 68000 Lang developed a series of exceptionally strong engines for the Mephisto range of chess computers for Hegener & Glassner, including sought-after models like Mephisto Portorose, Mephisto Vancouver and Mephisto Berlin. Though Lang didn’t forget his Intel roots and as the Intel progressed from the 8080, through the 286/386/486 years to the Pentium era, he produced Chess Genius which firmly established worldwide recognition. So how has it made the transition to Android? Impressively well, actually. Unlike Shredder, Chess Genius plays at full strength. The only alterable facets are the thinking time, with per move and per game timings available. The board quality also isn’t as good as Shredder on the same device, but the board is good enough and sufficient colour schemes to find something that’s usable. I’m using a Nexus S phone, so the touch interface is a little ropey and inaccurate. But I feel that’s a general problem with the phone rather than an issue with Chess Genius itself. But it is a little frustrating when the wrong piece is moved, or the right piece to the wrong square. Thankfully Chess Genius allows you unlimited undos, even while it’s thinking about it’s reply. The chess engine itself is exceptional. Certainly nowhere near the current top of desktop and multi-core personal computers. But, it offers a serious challenge on the low-powered ARM Cortex A8 processor of the Nexus S. There is a sense of accomplishment beating this little devil. Chess Genius plays a remarkable game, especially in it’s tendancy to counter-attack right at the point you think you’ve got a serious advantage, typically a sacrifice that demolishes your carefully arranged attack. Chess Genius is a joy to play. Though, I feel the a smart-phone doesn’t show off the potential of Chess Genius. I’m considering getting an Android tablet, because like Shredder on the iPad, I think this could be a winning combination. When I first got my iPad I keep rechecking the iPad app store to see if Chess Genius was available. It’s available as an iPhone app, but I would really like to see a proper “HD” iPad version at some stage. I hope running Chess Genius on an Android tablet will also take advantage of it’s screen size. Database-wise, Chess Genius is equipped with load and save options of PGN files that are on the device. Loading a PGN file allows you to pick a game from the list, see the raw PGN and playing through the moves to that game (although starting from the final position). Switch to analysis mode and you get real-time analysis of the current position. No adding of annotations, though. I was extremely pleased to see Chess Genius available on the Android App Store, especially at a price of £3.00 – that’s incredible value. There’s a Chess Genius Lite available for free, which has serious limitations, but it’s good enough as a hardware check. The low price of the full version was such that I didn’t consider the Lite version for a second. Despite initial excitement, I’ve not been disappointed. Although the Android version of Shredder looks better and feels better, I find that I’m preferring Chess Genius for it’s raw chess engine strength and it’s enterprising attacking style. If you are a regular chess player or afficiando and you have an Android smartphone I heartily recommend installing this Richard Lang masterpiece. 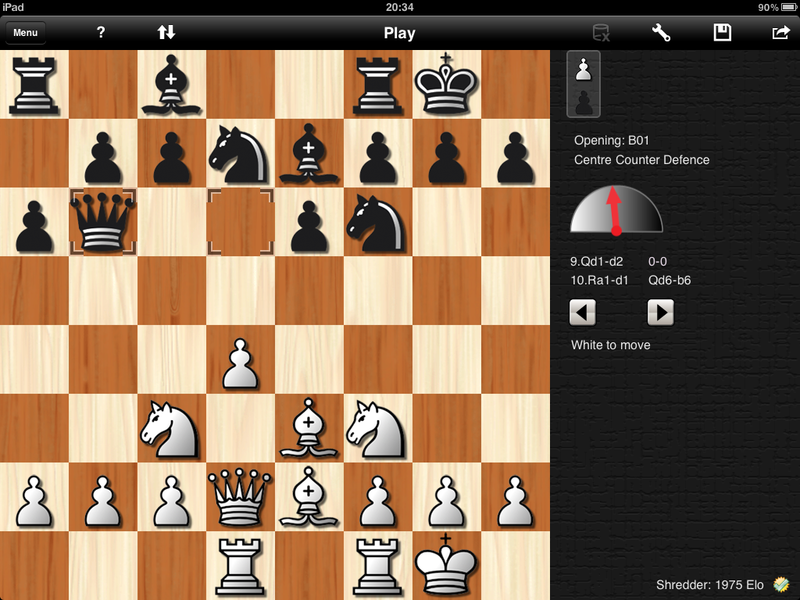 The first strong chess engine to land on the iPad is Stefan Meyer-Kahlen’s Shredder. Shredder has won a dozen computer chess world titles since it’s inception in 1993, and is part of Chessbase’s range of supported engines. The original Shredder chess engine is written in ANSI-C, that portability explains why it’s the first serious chess engine to arrive on the iPad. But Shredder is perhaps the only serious commercial chess engine that can be called cross-platform, supporting Windows, Mac and Linux. The Linux version requires Java, and the Mac OSX version seems to be native. Shredder has made the transition to the iPad’s ARM-based A4 chip. Obviously the low-power single-core CPU isn’t conducive to deep brute-force calculation, but it still plays a very decent strong game with a customisable strength from 850 to 2600. Though it remains to be seen (through extensive testing) how accurate these rating are to real-world ratings. Shredder keeps track of your playing performance long term and over the last 10 games, and adjusts it’s playing strength based tailored match your own. This offers an interesting game (since who wants to be demolished game after game?). Every time you lose a game, Shredder drops it’s playing strength relative to your own, and as you win, Shredder notches up it’s playing strength. The interface is initially a little clunky, with the main configuration screen essentially being a splash page. But the meat of the application is a high-quality full-size chessboard. The touch-drag interface very natural and pleasing. The clunk of chess pieces being plonked down is satisfying. 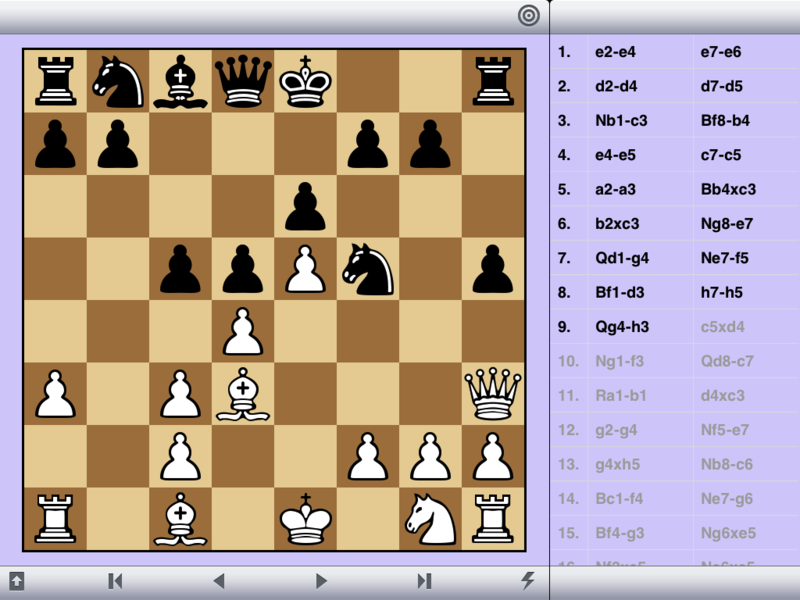 Chess software and touch screens are a dynamite combination. I’d prefer to be able to see all the moves (or be able to scan through them), and use that to jump to a specific point. Navigation is only forward and back currently. The speedometer is a nice feature showing the evaluation of the position, though at times it is difficult to figure out which direction means the position is in your favour. I’m hoping updates will fix some of these oddities in the interface as well as offering some serious chessplayer features, like chess databases and PGN support (perhaps combined with Dropbox, which seems to be the default way to share data with an iPad). As an aside to just playing chess, Shredder offers a series of tactical puzzles, about 2000 of them. Every puzzle is worth 10 points, both spending too much time and making an incorrect move lose you points. The positions are interesting, although at times it’s difficult to figure out quickly who is to move and which direction they are moving. It shows off yet another facet of chess software and touch screen interfaces: their potential value as a teaching or training tool. There’s also an analysis function which is useful for the occasional check whilst on the move. I wouldn’t be using it for serious tournament preparation, except as a form of blunder-check, but useful for lightly examining a game. Shredder is stunning on the iPad. It feels perfectly suited to the touchscreen. At the current price of £5.49 it is a very worthwhile investment for club players or regular tournament players.